It's back-to-school week for millions of American children, which means it's time to debate the federal government's role in deciding what our kids should eat for lunch. In 1946, the Truman administration formalized the feds' school-nutrition role. During both World War I and World War II, after all, the government had noticed some recruits suffered from malnutrition and stunted growth. To address the problem - and win the favor of food producers - the National School Lunch Act was passed into law. Though lots of debate and politics still surround the program, the premise is reasonable enough: For some of America's poorest kids, a hot breakfast or lunch at school may be the only decent food they have all day. In response to America's obesity epidemic, first lady Michelle Obama championed good nutrition through the Healthy, Hunger-Free Kids Act of 2010. It limited fats, sodium and sweets in school lunches, as it reduced portion sizes. 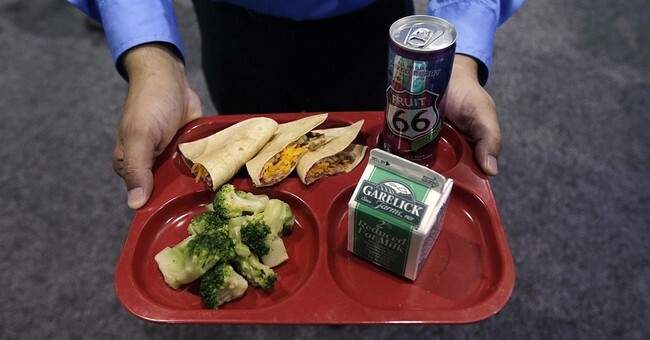 The Trump administration, which argued that many kids refused to eat the healthier, less-tasty fare, relaxed the school-lunch rules. According to Business Insider, kids are again consuming "sugary chocolate milk, fewer whole grains, and around 300 extra milligrams of salt." Early in the school year, she approached the daily burden with great enthusiasm. We never got name-brand treats, such as Hostess Ho Hos, but she'd make a fresh ham sandwich, give us a fat peach or pear and sometimes mix up a batch of butterscotch pudding and put it in a small thermal container. Unfortunately, her enthusiasm waned by the second week of school. The rest of the year, my lunch consisted of two end pieces of Cellone's Italian bread and a hunk of bologna glued together by warm mayonnaise, plus some celery or carrots, some peanut butter crackers, and a Washington apple for desert; the apple was usually littered with multiple half-moon cuts, as my sisters examined every apple with their fingernails before choosing one to eat. And every day, I sat next to Jimmy Schmidt. His lunch consisted of peanut butter and jelly on fresh Wonder Bread, a can of Coke, Hostess Ho Hos and a Nestle Crunch bar - not exactly nutritious, but lunch heaven for a kid back then.